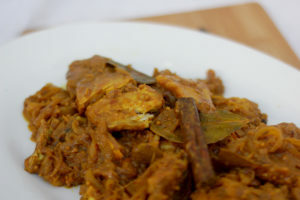 Cape Malay Pickled Fish is a traditional Cape Malay favourite. Beautifully, flaky fish that’s packed with flavour and a hint of spice. It’s the kind of recipe that is handed down from generation to generation. Start by heating 1 tablespoon of the olive oil over a medium heat, before sautéing the onions. Once soft, add the ginger, garlic and spices and fry for around 3 minutes. Next, add the vinegar and sugar in and stir continuously, until the sugar has dissolved – then leaving it to simmer for around 20 minutes. While that’s going, dust the fish with the flour – be sure to shake off any excess. Heat the other tablespoon of oil in a heavy-based frying pan and fry the fish until golden brown. Then layer the fish in a container and pour the sauce over – continue doing this until you’ve used all the ingredients. TIP: It’s best enjoyed after two or three days – the flavours will develop.